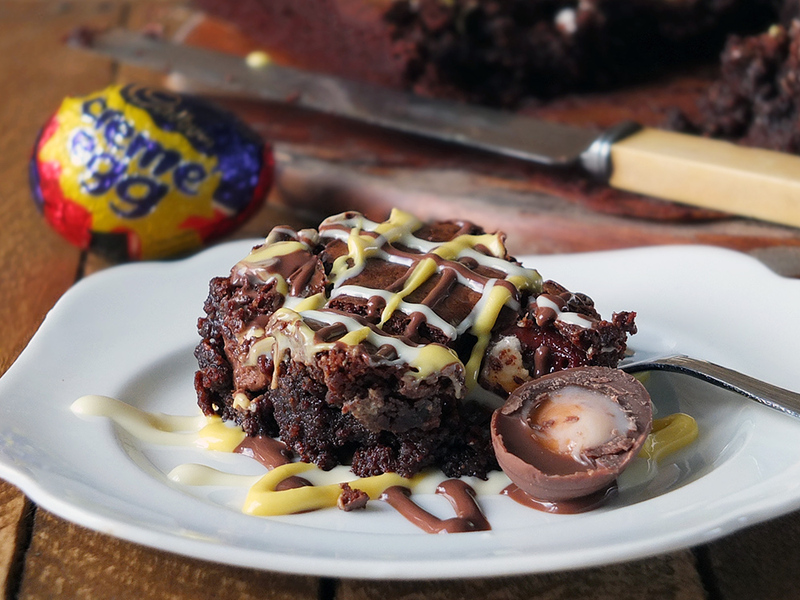 A deliciously moist super chocolatey brownie baked with Creme Egg Easter eggs and drizzled with milk and white chocolates. The perfect Easter treat! This post contains Amazon Affiliate links. As an Amazon Associate, we earn from qualifying purchases. Are you looking for the ultimate gluten-free Easter bake? Even if you don’t follow a gluten-free diet (I don’t) I’ve got your back covered. These brownies are a slight adaptation to my ever-popular Ooey Gooey Gluten-Free Brownie recipe that I made some years ago, a recipe which is consistently in the top ten viewed posts on my blog every. single. day. The amount of positive feedback I’ve received on that recipe post is overwhelming. So, with this recipe, I’ve jazzed up my ooey gooey gluten-free brownies for Easter. A note – Cadbury Crème Eggs are not officially gluten-free, but they do not have any gluten-containing ingredients listed on the label. Celiac.com consider them safe for those following a gluten-free diet but do not recommend them for sensitive individuals. Always read the labels and make judgements based on your knowledge about your sensitivity and comfort levels. As I said, I don’t follow a gluten-free diet, but I reckon these brownies are right up there as one of the best brownies I’ve ever eaten, gluten-free or not. The secret is not to use a gluten-free flour substitute, but rather, ground almonds. Dark chocolate is an absolute must too, ideally 85% cocoa solids, but it’ll still work with as little as 70%. Get some decent eggs too, preferably free-range organic ones from a farm you trust (mine are currently coming from a croft on the island of Bressay until my Turriefield veg box starts up again). They’ll have gorgeous rich yellow yolks. Dark brown soft sugar gives the brownies a gorgeous fudgy flavour, and the caster sugar (or granulated if that’s what you’ve got) cuts through the bitterness of the dark chocolate. It all just works together really well. Trust me. Before you start anything, boil the kettle and fill a large pot (the one you cook your spaghetti in) with about three inches of boiling water. Put the pot on the lowest heat you can. Break the dark chocolate into small pieces, place in a large heatproof bowl along with the butter and place the bowl on the top of the barely simmering water. Ignore it until you’re done the next few steps. By then, it should be deliciously melted and chocolatey. 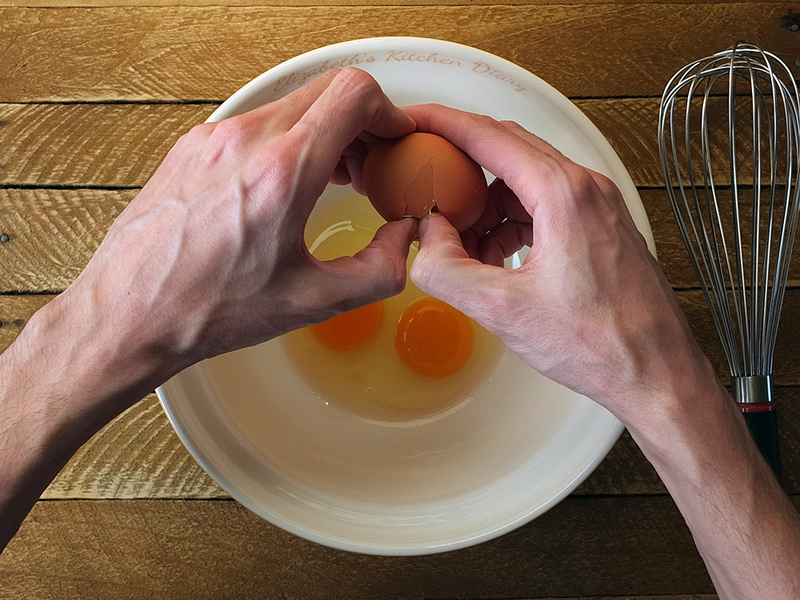 Crack your eggs into a bowl and whisk until they are light and fluffy. 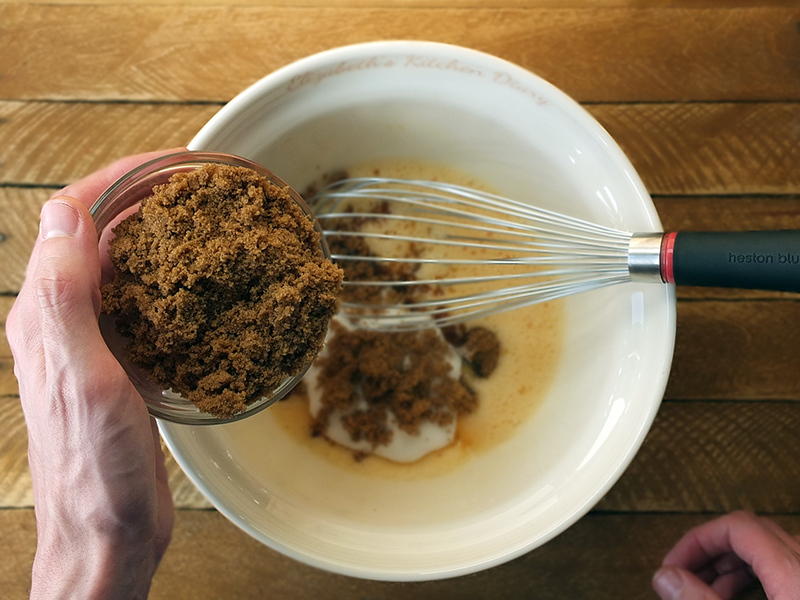 Add the soft brown sugar and caster sugar (or granulated, if using) and whisk for a good few minutes until everything is well incorporated. By now, your chocolate and butter will be melted. Give it a good old stir and pour it into the egg mixture. Whisk again. Carefully fold in your ground almonds with a wooden spoon and then pour the whole thing into a prepared baking tin. Stellar Square Cake Pan, 23cm/9"
A note here on baking paper – make sure it’s a good non-stick one if you don’t want bits of paper stuck to your brownies. If you don’t have a baking tin with a removable base it’s a good idea to use one whole piece of paper for the bottom and sides of the tin, so you can remove the whole tray of brownies at once when they’re cooled enough. Next, take a packet of mini crème eggs and carefully cut them in half lengthwise along the join. Arrange on the top of the brownie batter and bake the whole thing in the centre of the oven for 35 minutes if you want deliciously gooey brownies, and 45 minutes if you prefer a harder brownie. Either way, they’re still delicious. Leave the brownies in the pan to cool completely before removing. To prepare the chocolate decoration, melt your milk chocolate and white chocolate the same way as you did the dark. Divide the white chocolate in two and add a few drops of yellow gel food colouring until it reaches a colour you like. 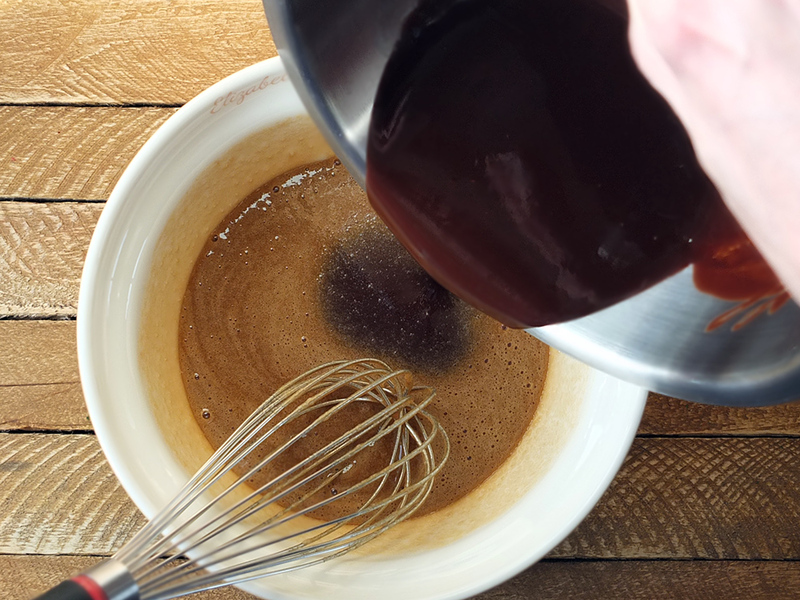 Make sure to use gel colour, as the drops, for some reason, make the chocolate solidify. Gel colour will leave the chocolate still runny. Pour the melted chocolates into three disposable piping bags, snip off the tips and drizzle across the top of the cooled brownies. Slice and serve! I used a little of the extra melted chocolate to decorate a plate before arranging a sliced brownie on it with half a crème egg to garnish. My husband can vouch for the tastiness of this particular brownie slice, pictured below, as he got to eat it when he got home from work. This time of year crème egg recipes are quite popular amongst us food bloggers. Last year I created a No Churn Cadbury Creme Egg Ice Cream Cake. You might also like Claire’s Cadbury Creme Egg Scottish Tablet, Helen’s Cadbury Creme Egg Fondue, Lucy’s Slow-Cooker Creme Egg Chocolate Cake. 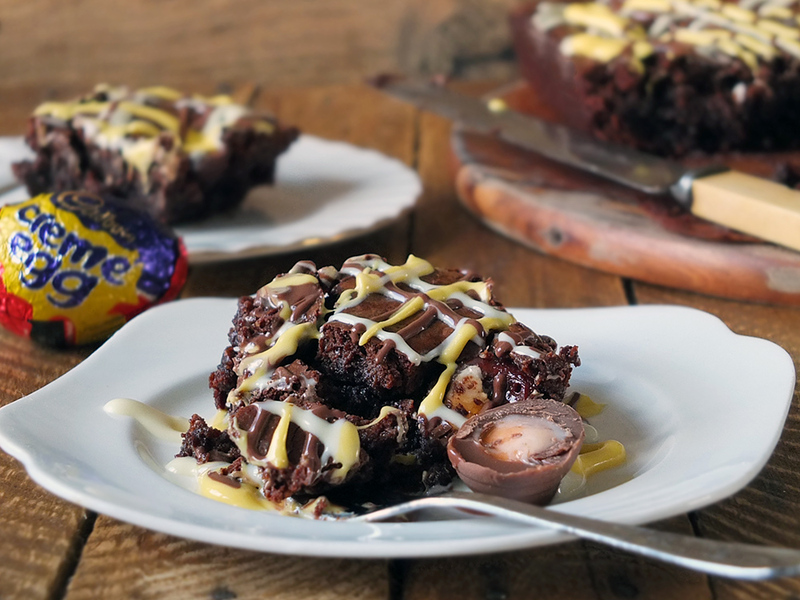 Emma has created a Cadbury Creme Egg Bundt Cake while Bintu has her own Creme Egg Brownies recipe with some rather clever ingredients in it. Choclette has blogged some rather fun Creme Egg Buns and last but not lease, Rebeccas has turned her crème eggs into Creme Egg Stuffed Chocolate Cookies. 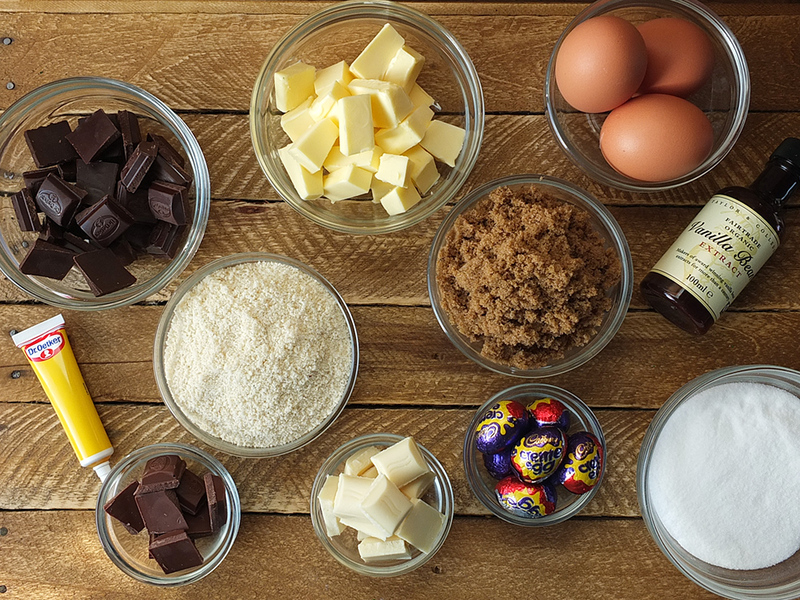 Last but not least, we can’t forget Sarah’s infamous Creme Egg Cheesecake recipe – that thing goes viral every year! Seriously, us bloggers love our crème eggs! What’s your favourite way to eat a crème egg? Let me know in the comments! 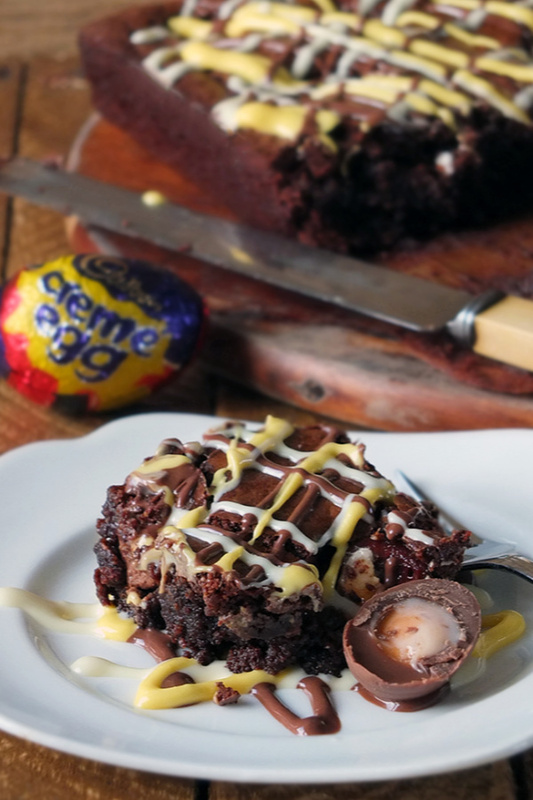 A deliciously moist super chocolatey brownie baked with Creme Egg Easter eggs and drizzled with milk and white chocolates. The perfect Easter treat! Preheat oven to 180 C/350 F. Lightly grease a 9-inch baking tin and line with non-stick baking paper. 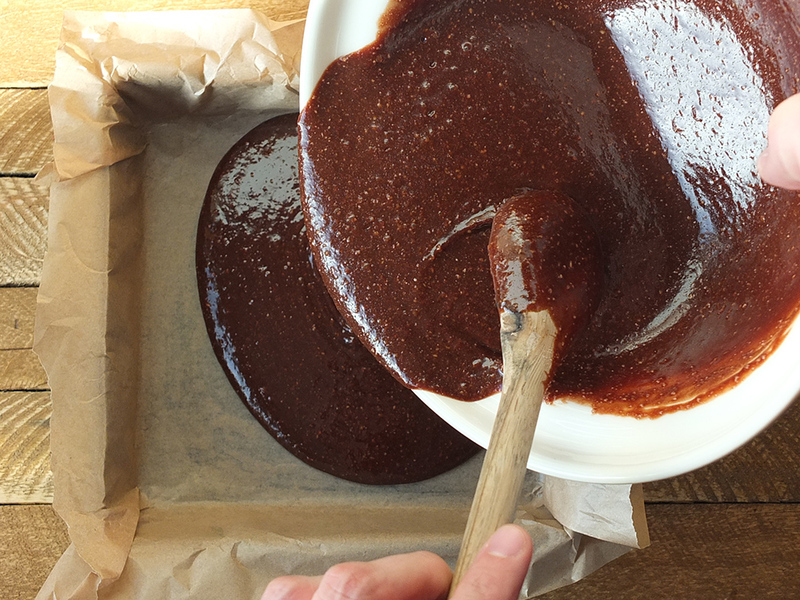 Break the dark chocolate into small pieces and place in a heat proof bowl along with the butter. 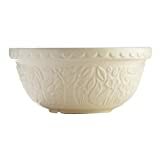 Suspend the bowl over a pan of barely simmering water and leave to melt. Beat the eggs with a whisk in a large bowl until they are light and airy. 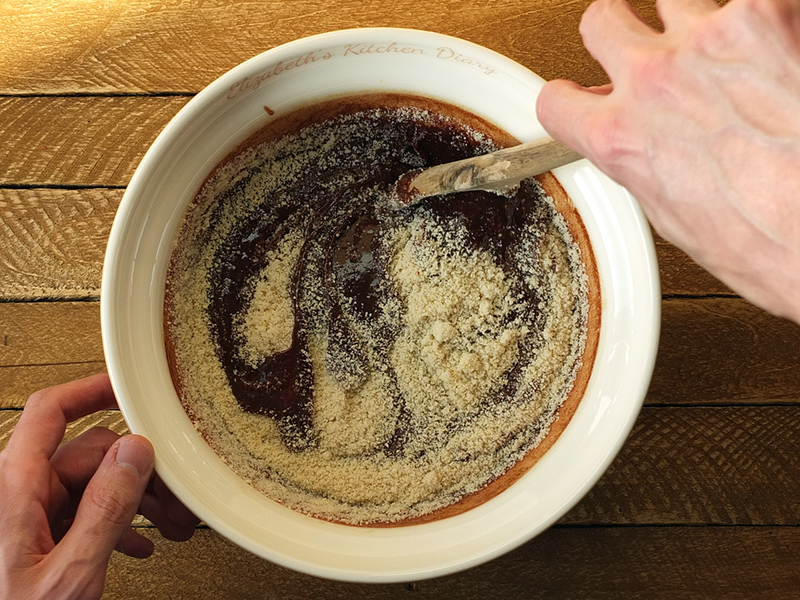 Gradually add the white and brown sugars, beating continuously, until the mixture is thick (about 3 minutes). Stir in the melted chocolate mixture and the vanilla extract. Using a wooden spoon, fold in the ground almonds. Spoon into the prepared baking tin. 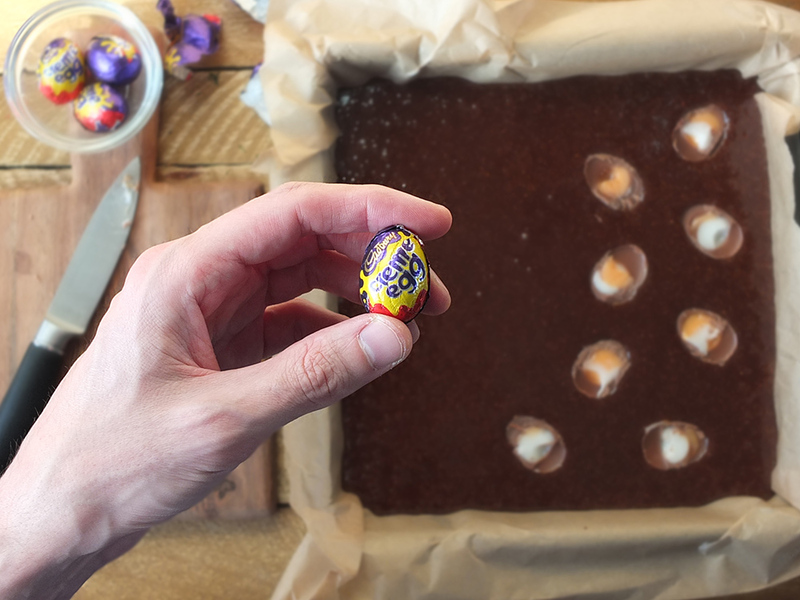 Carefully cut each of the mini crème eggs into half and arrange all over the top of the brownie mixture, cut side up. Bake in the centre of the oven for 35-45 minutes (35 for gooey brownies, 45 for more set ones). Melt the milk chocolate and white chocolate in separate bowls above pans of barely simmering water. 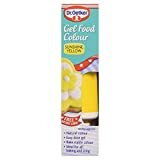 Divide the white chocolate in half, and colour one half with a few drops of yellow gel food colouring. Pour the cooled, melted chocolate into piping bags and decorate the top of the cooled brownies. Brownies will keep for several days in an airtight container. Cadbury Crème Eggs are not considered to be gluten-free as they are made in a factory which also handles wheat. However, their ingredients lists, in both the US and the UK contain no gluten-containing ingredients. It is important to read labels, check manufacturers websites, check ingredients and allergen lists, and to make judgements based on your own judgement about your sensitivity and comfort levels. 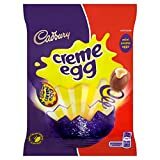 In 2016 Celiac.com added Cadbury Crème Eggs to their 'safe Easter candy list' for those following a gluten-free diet, but they do not recommend them for sensitive individuals. Visit Celiac.com for more information. There are 16 Smart Points per serving. This looks so yummy~ I am going to have to try it! I think I gained 5 pounds just looking at those delicious photos!! I will definitely try to make these! This a brownie I’ll love to make this Easter for my family. It looks delicious and will garner raves. I will be honest, one of the reasons I always look forward to Easter is for the Cadbury eggs lol Their Creme Eggs are soo good! My mouth is watering over this! This looks super yummy. I am so trying this for Easter this year! Yum! This would be such a big hit in our family, it wouldn’t last very long at all! It looks absolutely delicious! Creme eggs are one of my favorite indulgences for Easter. I had never thought to use these Easter basket treats in a brownie. I bet it tastes amazing! I love all the Easter treats, especially Cadbury Crème Eggs. These brownies are happening immediately. I amy not tell the kids I made them and eat them all myself. I have been back and forth about going gluten-free for about three months. Seeing this delicious dessert has made up my mind that I can do this! The fudgy flavor sounds like it would be really good with those creme eggs. This is such a cool idea for Easter! Seriously. I think this is one of the best dessert recipes I’ve seen in a long, long time. I love chocolate and gooey, fudgy chocolate. Yum! These look delicious. I know a few people who love creme eggs so I may have to give this a go for them. Yes please, this delectable treat would have t be made in triple quantity for my household. As it would be an instant favorite and I’d need one just for myself. Thanks for sharing with #WeShouldCocoa BTW and for linking to one of my recipes. I’ve pinned to several boards and shared all over the place. 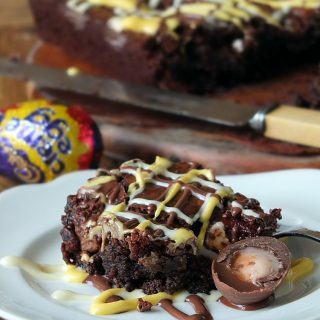 Oh, I want a creme egg brownie! These look delicious, and using the Cadbury eggs is a brilliant idea!! Oh my gosh this looks amazing. Ive pinned it! These certainly look super gooey Elizabeth and gooey brownies are the best brownies. Re Creme Eggs – Coeliac UK approves Cadbury Creme Eggs as gluten free and states that they ARE suitable for a gluten free diet. It is possible that Creme Eggs in the States are made differently, but in the UK they are considered safe. I love cream eggs and it’s such a shame that you can only find them in shops around Easter time. I actually never thought of using them to make a cake, but it does sound so delicious! Brownies are some of my favorite cakes, and the gooey eggs inside can only be a delicious nice surprise! I have never done brownies for Easter! But I’m sure my children would love this recipe, as they are all chocolate fans! OMG!! 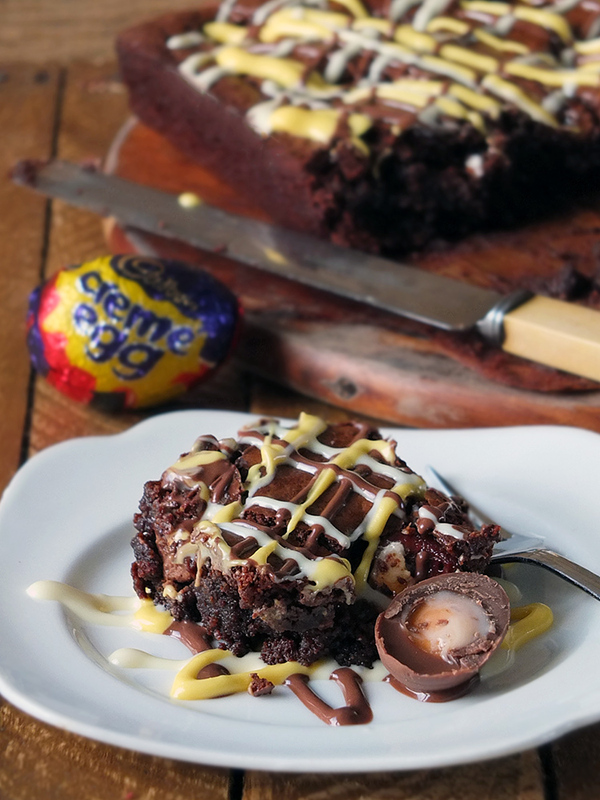 This gluten-free creme egg brownies looks delightful and really tempting. I would love to try this recipe for my kid’s snack. They will really love this for sure. These would be finished in no time at all here – I’d have to make a double batch! Perfect for some weekend baking! Oh my goodness that looks completely delicious! I think I just died and when to chocolate heaven! I love that this recipe is gluten free, I don’t exactly follow a gluten free diet either but the recipes are healthier without sacrificing taste! Case in point, this lovely dessert that you shared! Being gluten free I LOVE recipes which can actually eat. I love creme eggs, I will definitely be making these!!! Thank you for sharing this recipe! 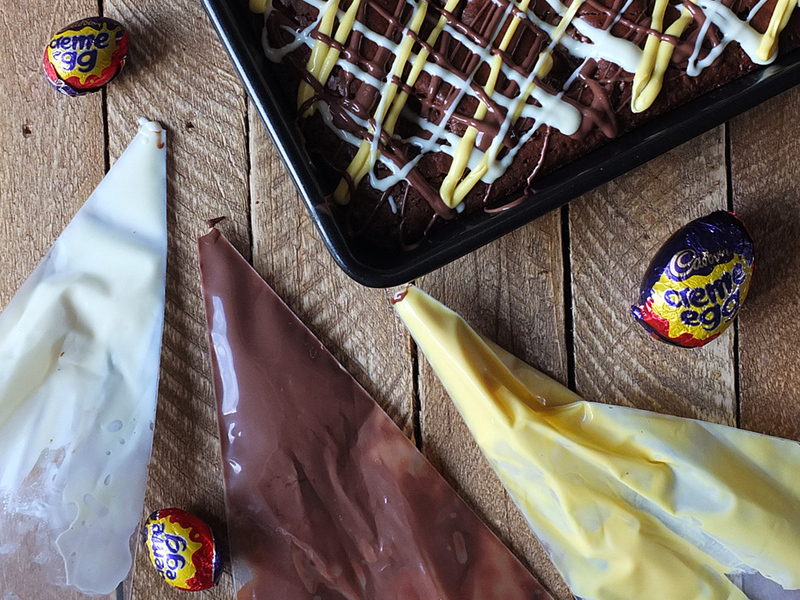 Creme eggs and brownies – a delicious combination and just right for Easter! When I saw the picture of the cakes, I really wanted to have a bite! So pretty, so tempting and so creative. I am not sure I can achieve and accomplish this piece of art but I would really wanted to try one bite. Wow these look so yummy! I never thought to make them with creme eggs before. My kids will love these! Love your pictures too! Oh wow, these look immense! I love anything creme egg themed. Will definitely give these a try! Cadburry Eggs are my favorite! This looks soooo good! I’m not a fan of creme eggs. But I might try this with caramel eggs instead! I didn’t think one could improve on brownies but I guess you can!! I like those little mini cream eggs. Oh my these sound lovely. I am gluten free so this is a winner with me. 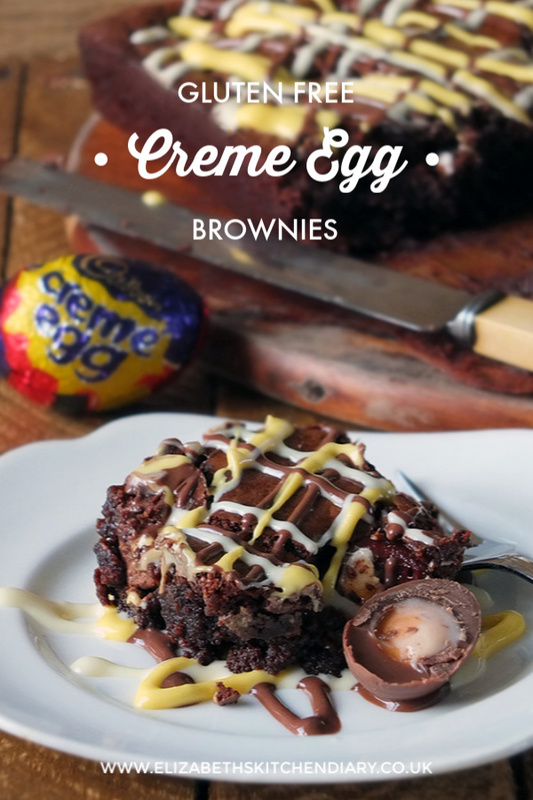 I am not a huge fan of Creme egg, however this recipe sounds amazing and not to mention look fabulous! You have a great talent, glad that this recipe is gluten free too! Those look amazing. I’m a bit amused though since the ad that popped up at the bottom of the post whilst I was reading it was for Weight Watchers. Still, a little of what you fancy does you good! I often prefer gluten free chocolate brownies and cakes as the ones with ground almonds instead of flour are so much more moist and decadent, I love the texture. These look utterly divine! Though I am not into cooking and baking much but your brownies are luring me to try something amazing as looking in your pics and with recipe at hand I can take a chance. Oh my goodness, that is the naughtiest looking brownie I’ve ever seen!!! My niece and nephew would love me if I made this for them, it looks so indulgent! I’m not a fan of brownies but these look delicious. Strangely, I was planning on making brownies with ground almonds instead of flour today. I’m so glad I was, because after reading this post I am truly lusting after some ooey gooey brownies. Hadn’t thought about adding creme eggs, but that can only make things better. I know why it’s one of your top posts, they look amazing. I’m vegan and could veganize your recipe, but not the creme eggs. That’s one candy they haven’t veganized -yet! This is something fun I can do with the family. I love how you are so ready for Easter already! Cadbury eggs, chocolate ANYTHING, I seriously cannot resist. This looks so yummy. I’m a mess around Halloween ,Easter. .any holiday! My sweet tooth cannot resist! That brownie looks amazing, thanks for sharing the recipe. Perfect for Easter. Oh my gosh, I’m totally sold on these! And I eat gluten! They look and sound so good. Bet they taste even better! You know, to this day (as crazy as it sounds), I’ve never actually tried one of the Crème Eggs! But this recipe looks so delicious, and I’ll have to try it this year for Easter! I’ll be honest, I never got the obsession with these eggs until I saw this recipe!! Holy yum this looks to die for! Definitely making these for easter! I actually said “OH MY!” out loud when I saw that first shot. Gluten free or not I want a big slice of that right now. OK, now I am off to share this one. Everyone needs to try it! I am obsessed with the caramel filled eggs. I might make that swap but what a great idea! This looks AMAZING. Super sweet…I may only be able to eat a small piece lol. My dad always loved Cadbury eggs (unfortunately for him he is diabetic now and can’t indulge like he used to) so I always think of him when I see them! Even the picture showing the ingredients alone promises this to be tasty, but my, the finished cookie must be heavenly delicious! I love the decoration, too. That looks extremely decadent and delicious! I would love to try it. Oh wow! This is definitely a neat treat for the Easter holidays. Oh wow! These look amazing. I have to give this recipe a try… it’s no good for my diet though, is it? Creme Eggs are my favourite Easter treat of all time! Such a shame you can’t get them all year round. I’ll definitely be trying this recipe soon. Tis the season afterall! I had that thought too – with a gorgeous caramel drizzle over the top. Swoon! Looks completely decadent! My family loves these creme eggs. I’ve never thought to bake with them before. I am definitely behind on the trends! Oh gosh, these brownies look SO good! I do love creme eggs so always enjoy all the creme egg recipes this time of year. Oo this looks delicious – crème eggs are one of the best things about Easter chocolate!! This. Looks. Amazing. I’ll be sharing it with everyone I know…! 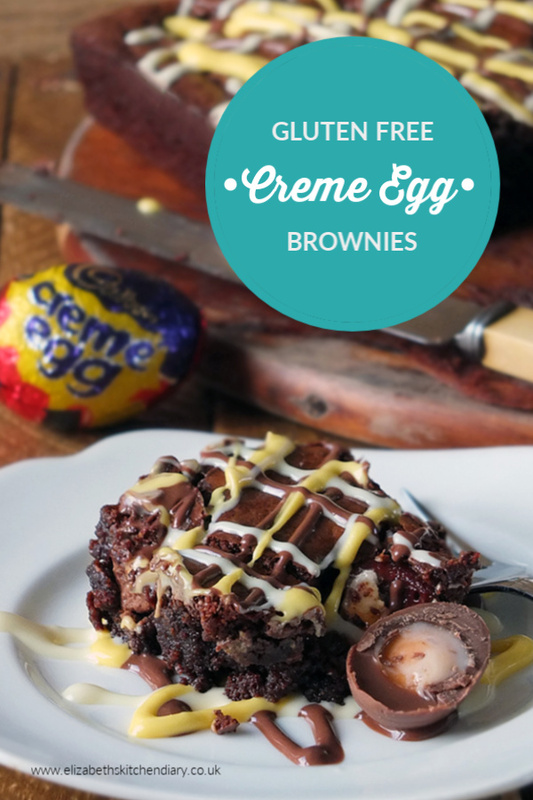 We love brownies and creme eggs and these are extra special as they are gluten free as well so great when we do play dates with kids.